Dromen&Co Apothecary (Dutch for 'dreams company') is a three-weeks-old makeup and personal care brand that makes highlighters, blush and removers in an easy-to-apply paper format. The apothecary range draws from the ancient wisdom of Ayurveda, and promises massages that have never been so simple. These two wings, together, form Dromen&Co Apothecary. Years of research and time has gone into bringing these strangely fascinating beauty and wellness products to India. Kanishka, the art and design student who was obsessed with creating and developing something unique, met a whole bunch of dermats and beauty experts across the globe before she decided to engage an international supplier to create these unique kinds of paper and Ayurvedic stone massagers. The legwork aside, these papers are really magical in that they can be carried around to replace blush, highlighters and cotton pads (these pads just need a few drops of paper to take all that grime and eyeshadow off). 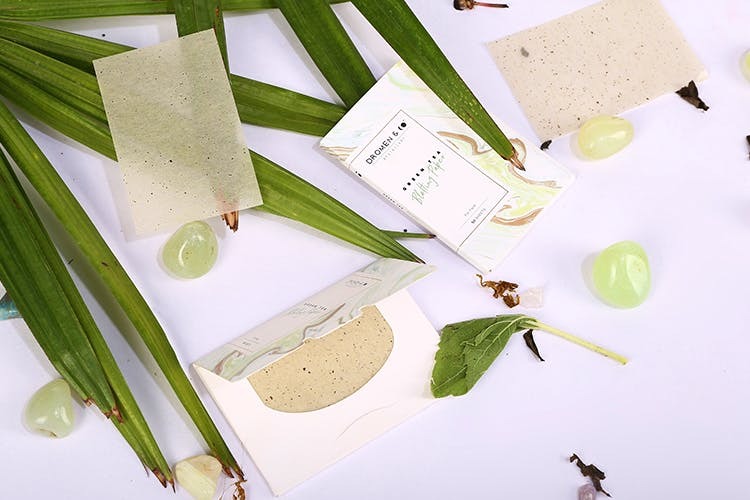 We're pretty sure their Green Tea Blotting Paper is quite a Godsend too (it wipes of shine and excess oil from the face and works for both men and women). Know what all this means? Your makeup pouch will be saved all the trouble of lugging around so many products. The stone tools in the apothecary section are natural and comprise two stone massagers currently. Their intention is to ease out knots, boost blood circulation and offer complete rejuvenation. We’re told the Gau Sha Stone can enhance blood circulation across the body by 400%! Beat that? The brand has six products, but Kanishka is planning on adding more over a period of time. We don’t know if a lipstick paper has been conceived yet, but it’ll be such a saviour. Aside from that, we’re pretty kicked about trying out these paper products. They also offer express 2-day delivery in case you’ve got a vacation planned and last-minute shopping to do.